There is no end to the cyber criminal attempts to extort financial gain from unsuspecting computer users. 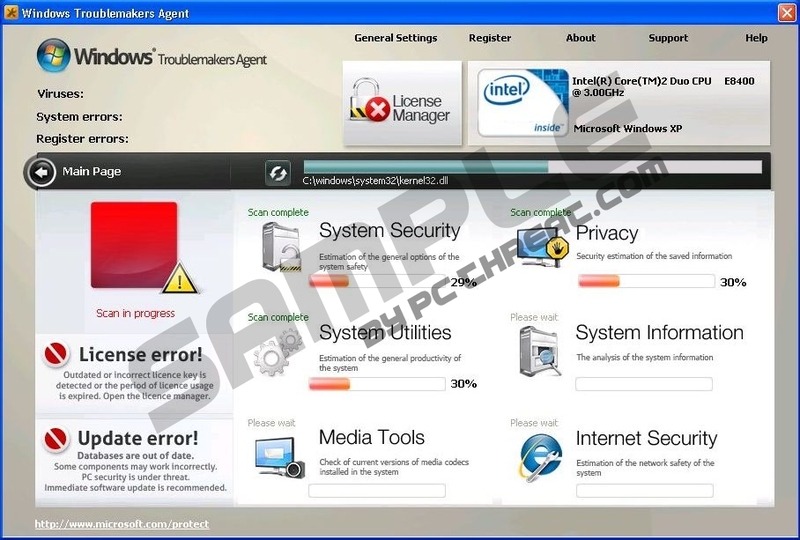 Windows Troublemakers Agent is yet another member of the huge Fake Microsoft Security Essentials fraud, which encompasses such notorious pests as Windows Defence Center, Windows Error Correction, Windows Optimal Tool and many more. These rogue system optimization applications share similar design, copying the symbols and color schemes from genuine security products with intention to trick the innocent users. Windows Troublemakers Agent has the ability to stealthily enter your system, because you can’t really pinpoint the exact moment when it slithers inside. You might actually be infected already. If you want to check your computer for the Windows Troublemakers Agent infection, feel free the use the suggested malware scanner. Quick & tested solution for Windows Troublemakers Agent removal. 1. Reboot the computer. When it’s on again, you will see the rogue’s application on the screen. Click “OK” to make it disappear. The rogue will start a fake system scan. 2. Wait for it to finish and then you will see another fake security message. Click “OK” again. 3. Now it is possible to make the message go away. Click on the red “X” at the right top of the notification. 4. The notification will disappear and you will have your desktop restored. Microsoft Security Essentials detected potential threats that might compromise your private or damage your computer. Your access to these items may be suspended until you take an action. Click \'show details\' to learn more. The detected vulnerability may result in unauthorized access to private information and hard drive data with a seriuos possibility of irreversible data loss and unstable PC performance. To remove the malware please run a full system scan. Press \\\'OK\\\' to install the software necessary to initiate system files check. To complete the installation process please reboot your computer. Needless to say, that you should by no means trust these notifications. They are obviously fake, and the poor syntax and spelling of these messages only support this claim. And nothing good can come from a fake program. Windows Troublemakers Agent only bombards you with these messages, so you would be convinced to buy the license for the full version of the program. If you do so, consider your money as good as gone forever. Not to mention that this rogue also significantly slows down your computer performance which eventually can results in a total system crash. Don’t hesitate any longer and terminate Windows Troublemakers Agent from your computer.